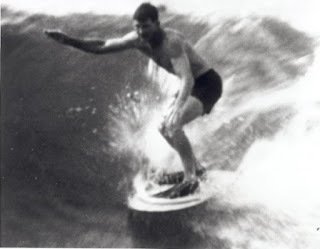 Welcome to this chapter in the LEGENDARY SURFERS series, on Wallace "Wally" Froiseth! Wallace Froiseth was born in Los Angeles on December 21, 1919. His family came to the Islands in 1925. “Summertime, back in the ‘20s,” Wally told me, “my father would drop us off down Waikiki and, you know, we’d be around the beach all day; surf and what not. Then, he’d come home from work, pick us up in the evening and bring us back to where we lived in Kahala. “As we grew up, we used to rent boards from the old Tavern; 50 cents-a-day, 25 cents-a-day kind of thing. And, then we finally got some boards of our own. We were able to buy or somebody gave us some. “Eight, 9 or 10; something like that. “I don’t know. I seemed to take to it real heavy. Even my brothers – my real brother and I, we progressed up to Castle, but my other brothers weren’t that interested in it for some reason. They surfed all right; Queens, around that area. But, my brother and I weren’t satisfied with that. Rocky’s, Cunha’s – you know – bigger surf like Public Baths and then Castle. “I was surfing Castle when I was, like, 11 years-old. I remember my brother kind of scolding me, because I went a little faster [further sooner] than he did. He was always mad because he was scared for my safety. One of the most influential surfers in Wally’s life was Tom Blake. “Tom Blake didn’t actually make those hollow boards down there [before they were manufactured in the early 1930s]. This guy Abel Gomes made the boards. He was a woodworker. Tom wasn’t that much of a woodworker. But, he had the ideas, you know. He knew what he wanted. “What about other surfers you looked up to?” I asked him. “Another was a fellow by the name of Ox Keaulana – big guy. Of course, the Wili Wili brothers and, you know, Duke and all his brothers – they were all big on the scene; Akong Pang, Joe Pang’s uncle. Blue Makua was in our group. Steamboat Makuaha, senior: I kind of looked up to him... those guys ruled the beach. Blue and I and all of us kids – when they had that jetty going out, you know, that walkway from Moana – we used to – wise kids and all – we’d go surf in between the piles and all that kind of stuff. Steamboat come along: ‘I told you kids, get outta dere,’ slap us in the head. You know, he was afraid we’d get hurt, cuz there were barnacles on the pilings. You could get hurt. Young kids, though, would do it. “What about Dad Center?” I asked him. “I got beautiful pictures of him.” Wally pulled aside an older-than-the-rest photo album. “Another guy, Buddy Adolphsen. He made our team pretty famous later on for patrolling the North Shore. We went to school together and all that kind of stuff. He went into the police department. When he retired, he wouldn’t quit patrolling the North Shore and rescuing guys, just like he had when he was younger. “Well, when we were living down Kahala. See, Fran lived right next door to us – small kid time. John Kelly lived at Black Point. “At that time, every surfer knew every other surfer. And, not only every other surfer, they knew every other surfboard. They knew exactly who owned the board. There were boards with initials and names and all kinds a crazy stuff and everybody had their own design. Wally had earlier mentioned the brotherhood that existed amongst the Empty Lot Boys and I asked him to elaborate on that. “Like I say, you knew you’d do anything to help the guys. We were really close. It was sort of a – it wasn’t a closed group. I mean, guys would come in, but it was a closed group in the sense that everybody who was tight in that group was really devoted to surfing. Surfing was practically their whole life. “I mean, we talked about it, slept about it, dreamt about it, ate it – everything! “We used to call it ‘surf drunk.’ There was not that many guys who were surf drunk, but we were. Guys came in – some of ‘em got to ride on big surf; like, Russ Takaki, you know; good friend... He’s one of the guys over here –” Wally pointed to a picture taken in the ‘40s. “— he surfed Castle too. He was one of the group. We clicked. “In those days – not only us, but everybody else, too – we had kind of a code, you know; code of ethics, if you want to call it that. Where – like I say, if a guy loses his board and you’re in or around – anywhere’s near it – you’d pick it up for him. Like, one time, I tandemed Tom Blake from Castle into the edge of the reef at Public Baths on my solid board! I mentioned to Wally that I’d read that there had been some trouble between the Waikiki surfers in the Outrigger Canoe Club and the new Hot Curl surfers who had been known as the “Empty Lot Boys” and later were associated with the Waikiki Tavern when they got older. “All the kids from the Outrigger used to tell all the girls our age, ‘Don’t fool around with those guys down at the Tavern. They’re bums and they’re, you know, not at your same level.’” Wally got slightly hot, recalling this. “That was the whole scene while I grew up. “‘These guys were telling me you guys were all ‘this and that’ and you’d do ‘this or that’ and all kind of stuff. “We were a... I don’t think you could say lower club, but, we were, like, The Empty Lot Boys. Then there was The Tavern People, then Hui Nalu and then Outrigger. So, I guess the further down the beach, you got lower! “As we got more into surfing, you know, we got better and got friends with The Tavern People. I never graduated from the Tavern area. That’s Queen Beach area, now. I was always there because all my friends were there. I grew up there. Everybody there was just a tight group. The only times you might mix with guys from Hui Nalu and some of the guys from the Outrigger, was night-time. “I always thought so, because we were progressing. We were doing things those other guys couldn’t do! We were the only guys that came out to bigger surf! You know, the word gets around in school. We’re talking about, ‘Hey, surfing Castle, big Public’s and Cunha’s, First Break...’ The rest of the kids, you know, they didn’t go out there. Very few went out in bigger surf. The bigger surf you go, the less guys go. “A couple of times, they had Honolulu Harbor closed,” Wally almost laughed. “We used to surf in front of Sand Island, too, you know. We were the only guys who surfed that area. I don’t know. The only guys we knew. But, with our Hot Curl boards, we could do a lot more – more challenge and we’d go lookin’ for it. “There were days when Honolulu Harbor was total white water across; wave after wave. Waikiki – John Kelly and I were out one day. The biggest day I’ve ever seen Waikiki. We were out. We went out about 5 o’clock in the morning. It was real – you know, not quite light. The night before, we just talked all about this big storm comin’ and all kinda stuff. So, we got together. He and I went out and got out there... After we got out Castle – I mean, big Castle – waves just got bigger and bigger... We were lucky to get out. Every wave broke around Diamond Head as far as we could see to the harbor. Whew! 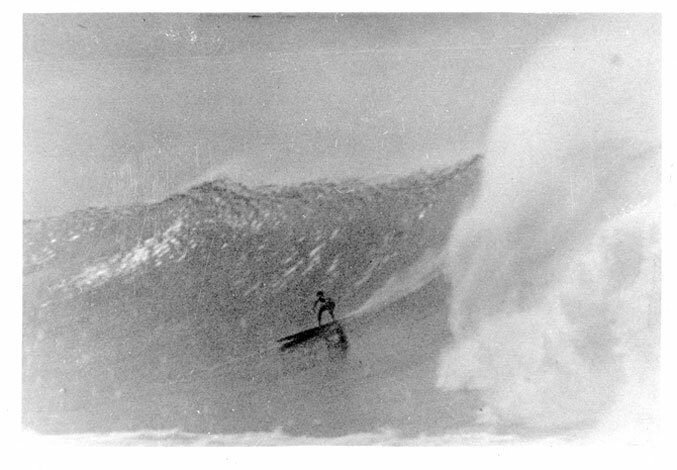 Lot bigger than these –” Wally referred to the picture Blake had given him of a big day offshore from Waikiki. “He and I, we didn’t catch for about two hours! We just sat there; never picked up a wave, eh? We just – ‘Wow!’ You know; awed by the size. “I was scared enough as it was. But, knowing Kelly... I know if he goes inside and I don’t do this, he’s gonna say I was chicken. He’ll tell everybody. So, I can’t have that! So, I said, ‘OK.’ He and I shook hands; next wave came, we started on it. “Kelly’s board hit a chop and he didn’t get down. But, my board – oh! Well, it was probably the smallest wave of the day, you know what I mean? I just went down, proned out and just – God! The white water about like as big as this room; can’t even breathe, sometimes, the white water was so massive. You just can’t breathe. You try’n keep your head up. So, I proned out and, by-and-by, it picked up again and going through Publics, I had it good – I mean, I had it great! At Cunha’s, I had to cut off, because, I mean – I could go on to shore. I could have made it all the way in, like everybody says Duke did, but who wants to go in there? I’d never get out again! And I was worried about Kelly. “At work, they told me, in January [‘39], ‘Take your vacation. You got a month’s vacation.’ So, I says, ‘OK, I’m going to take it in May.’ I figure, the surf in this area starts then. Wally described his log book rating scale: “M is monstrous, like August 25th of 1935... July 1928 and ‘29...” The scale went down from there; to huge, big, large and good. “At that time, the concept was a little different, you know. We wouldn’t do all these maneuvers that they do, today... That wasn’t being done... The guy that did that kind of surfing [cut backs, etc. ], if any, was my brother. We had a name for it... I forget what it was... It slowly developed into hot dogging. My brother Gene could stand way back and fool around like that more than any of the rest of ‘em. And, they wanted to share. “You see, in the old days, part of the enjoyment with us was watching other people surf. Like, at Castle. After you catch a wave and you’re paddling back out and see somebody catch a wave and come across, we used to just sit up and just enjoy him enjoying that wave or making it, getting caught or whatever it was. “Tom Blake, sitting outside, waiting for a set, talking all kinds – all these ideas... He and I used to see who could come up with the craziest idea. He used to say, put a big raft over there, have everybody just sit around and drink coffee or whatever, have a guy watching and then when a big set comes, everybody throw their board in the water and go catch the wave. “There’s another guy. Rick Steere. He was from the Outrigger. But... he was of the haole group, but he wasn’t, really – he was different. When I first met him, we were sitting out Castle, you know. It was big. My brother and maybe Oscar were out there and also John... And so, I see this guy. He was puttin’ his head down, coming from first break, solid redwood board; just doggin’ it [paddling hard]. And he paddled over and he got into the goddamn lineup. But, he was maybe 200 feet outside of us. And then this big set came... That was a real Bluebird. He picked up this wave and I’m telling you... that thing; easy 20-foot. “And so, I told those guys, ‘Who the hell is this guy? Where’d he come from?’ I’d never seen him before, you know. So then, what happened was, he got caught, naturally. He was outside of us before he got caught. “So, when the white water got to us, we went down. When I came up, I was looking around. ‘Where’s that guy?’ We were looking out to sea. Then, he came up inside of us. Inside of us. Hoses Christ! So... we all swam for our boards; got separated and I guess he went back and I didn’t see him anymore – that day, anyway. “He and somebody else imported...” Wally replied. “I can’t say who was the first guy, but, he had a balsa board and there was a guy – a real rich guy came from the Coast – and he had heard about this stuff. So, he had ordered one; ordered this balsa from Peru and they shipped it down and one of the beach boys over Waikiki made him a balsa board out of it. “I don’t know... I couldn’t say which came first. The first one I was associated with was the rich guy who had this balsa board made, shaped by the beach boys; my area. When the guy left and went back to the Coast, you know, he gave it to the beach boys. “So, I got to try it out. Boy, what a difference! Oh, the balsa board was fast! “My only problem with it, at that time, was the wide tail, see. But, the buoyancy, paddling speed and all that kind of stuff – hold you up out of the water so much better than the solid redwood boards, you know. No comparison. And, catching the waves – so easy! Catch ‘em a little further out and all that kind of stuff. I asked him about Tarzan being the first haole beach boy. “In the lifestyle you guys lived, were there other aspects of Hawaiian culture you incorporated?” I asked. “Canoeing,” Wally answered without a pause. “We were all heavily into canoeing; most all of us... Then, there was a group that only liked paddling – canoe paddling. We had some surfboard races in the mid-’30s, before the war. “I was always angered... The Kahanamoku group and Outrigger group had this big deal; whoever wins the surfing contest – they had teams. Duke and his brothers all had a team and we had our scavenger group down here. But, you know, we were surfin’ 8-9 hours a day and we were in top shape and we’d catch any thing in the water, you know what I mean? Frank Kennedy was with us. He, my brother, Gene Smith and myself made up a team, see. And we wiped ‘em out. We came first in almost every event. “Why I say I get angry, cuz the deal was, the team that wins is supposed to get a free trip to Australia – go over there and surf and all that kind of stuff. They thought they had it all sewn up, see. The Kahanamoku brothers were the big boys on the beach. Well, they were older guys that we looked up to, but, you know, we were feeling our oats – 18, 19, then. ‘They gotta show us they can beat us!’ That kind of thing. I asked Wally about his first memories of Duke. “To be honest with you,” Wally said, “he and I were great guys surfing together...” But, I got the impression that elsewhere was sometimes a different story. “In other words, he was one of the few guys’d come out to Castle, you know, from the Outrigger side. There was not that many who did. So, we had a lot of experiences together. I even dinged his big long board one time; put a big ding in it. He apologized to me, because I was on the inside of him. He was on the outside. With his big board, he couldn’t swing it fast enough. I had to get out of the curl, so, I ran right into his board. He and I had to swim in. “Besides that, we started racing with canoes. I was very upset with him, initially, cuz we had this race where – we were young kids and ignorant, see – he... put his canoe so that his ama touched our canoe and wouldn’t let our paddlers on that side paddle, so he just barely beat us and not in a fair manner. “‘He’s from the Tavern.’ So, that probably helped to get the reputation of Tavern guys being bad. “Fran Heath was one of the best surfers around, during all that time,” Wally declared. “We used to go hunting for surf – the same group – John, my brother, Dougie Forbes and a couple of other guys. And Fran was one of the guys. “I can remember times we went out to Mokapu, before they even had the Marine Corps Air Station, you know. It used to be private land, see; Big surf, Mokapu. “We used to take my ‘36 Ford, put all the boards in and go around the island – check surf; because, winter time, you know, no surf here. Here, Wally returned to the subject of Tom Blake’s first three aluminum skegs, one of which he had been given. “But, my objection to it was I thought I’d run over somebody in a crowd or something and hurt somebody. So, I was scared of it. Talk about skegs turned to tracking on the face of a wave and the difference between it and riding white water and Duke’s longest ride. “In those days, I was there [Castle]. I ran away from school so many times and I got kicked out of school [a number of times]. My old man would drop me off at the top of the hill. I’d look out there at the ocean. I had a way of judging it. If the white water was as high as the top of the trees, there was good surf; below the top of the trees or you’re barely able to see it – forget it. I’d go to school. “We used to sit on the beach, weekends, when there was just moderate surf; ask anybody on the beach; take ‘em tandem; Everybody. Any girl... We weren’t trying to make out or anything, we just wanted them to enjoy it. ‘Hey, wanna go out tandem?’ Some would, some wouldn’t. “Fact is, that’s how I met my wife – my present wife [Alice, a.k.a. Moku]. This guy Oscar had her out surfing and I had some other wahine out, too. Wally remained a force in surfing throughout the ‘50s, as he and the other Hot Curlers continued their love affair with Makaha and sometimes the North Shore. During this period, also, Wally spent much of his time organizing the annual Makaha surf contest, which became one of the most successful contests in the world. In my questions to him, I gave the era short breadth, however, because I wanted to get to that 1957 catamaran voyage Woody had told me a little about. It was a Hawai‘i-to-California trip they made in a catamaran Woody had designed and was the main builder of. The voyage was meant to qualify the craft in the TransPac. The Trans Pacific Yacht Race was a 2,225 mile sailing race from Long Beach to Honolulu. I asked him about an argument Woody had with the Cat owner. Here it was many years later – 1996 – and it was getting late in the afternoon. Wally and Alice had a meeting of the Polynesian Voyaging Society (PVS) to attend. Did I mention that Wally is one of the guys that helped revive Polynesian canoe voyaging, much in the same way as Duke Kahanamoku and others revived surfing at the beginning of this century? Open ocean voyaging in traditional double-hulled canoes had been a near extinct act. Now, thanks to Wally’s work and the work of many involved in the PVS over the past twenty years, open ocean canoeing is alive and well. More importantly, open ocean voyaging has stirred-up Polynesian pride in their recognition as the world’s greatest of navigating peoples. My time with Wally was running short, so I had to gloss over the 1960s, ‘70’s and ‘80s and get to present day. “We were talking about Fran and his board...” I prompted Wally about the first Hot Curl surfboard in later years. “We hadn’t seen each other in a long time. ‘Yeah, I’d sure like to see it, cuz I have fond memories of you surfing that damn thing.’” Wally looked at me, explaining, “It being the original thing – all like that. “So, I went over his house. He showed me the board. Aw, I was horrified. The thing was just termite-eaten, cracked – all those white stringers chewed-up. So, I asked him, ‘What happened?’ Turns out, he left it with his boy on the North Shore and he didn’t take care of it. Fran went out to see it one day, saw what a mess it was, and got angry with his boy; brought the thing back to his house. But, you know, it’s shot; never surf again with it. “‘I tell you what – lemme take the board –’ I fool around with wood and everything. ‘— let me take the board and I’ll try’n fix it up. It’ll take some time, but I’ll try’n fix it up. It won’t cost you anything, cuz I got wood and all that stuff already.’ He let me take it. “I was all anxious. I wanted to put it back in top shape, you know, cuz, hey, I got a lot of aloha for the board, eh? And, it is significant. “So, I brought it home and worked on it and it kind of inspired me to refinish my solid redwood board, you know. So, then I call him up, ‘It’s finished! Come pick it up or I’ll bring it out.’ He said, ‘No, just leave it there for awhile.’ He was moving from his house to an apartment and had no place to put it. I asked him about the boards in his cellar. I asked him about the other boards in his cellar, starting with the one that Fran and I had been particularly intrigued by. “Solid koa board,” Wally declared. “We researched the boards at the Bishop Museum... We wanted to know the background. We were really interested. And so, when I found out, gee, they had olo boards made out of koa and things like that, I wanted to make a board out of koa and see how practical it would be, because I know koa was so heavy and that sort of thing. “So, I made that board, but I made it in the Hot Curl shape, see. So, I figured, is this an advancement? Does it help, or hinder or what? “But, I gotta admit. I used that solid koa board about three times and I used it out in good sized surf at Castle and what they call First Break Elks Club – you know, outside of Old Man’s... I used it three times and I don’t see how those – well, the wide tail would probably help for buoyancy, you know; like the old boards were. So, that would probably help. But, once you set it, it’s so heavy and so solid, you can set it in only one direction and then you gotta live with it. You gotta catch the wave at an angle to begin with, otherwise you’d never get around – you know, depending on where you catch it. That’s your course. Of course, you’d rather catch it when it’s pretty well hanging, otherwise it’s just a swell. But, it worked good! There’s no problem with it, except you just set a course and go from Castle right to Public Baths – no problem. I mean, the glide was fantastic. It was a whole different thing. “Enjoy it as much as you can; to the fullest you possibly can. “I feel this way: I feel that any body that tries surfing will enjoy it. It doesn’t make any difference if you’re a world champion or whether you’re a weekend surfer. Some guys make fun of these guys that go around with the boards and get in the water once a week – that’s OK! They’re enjoying it! They’re enjoying it as much as they want or as much as they can. Gault-Williams. Interview with Wally Froiseth, April 3, 1996. See also Gault-Williams, “Surf Drunk, The Wally Froiseth Story,” The Surfer’s Journal, Volume 6, Number 4, Winter 1997. Warshaw, “20th-Century Radical, The Surfer’s Journal, Spring 1995, p. 31. Wally Froiseth quoted. Young, 1983, p. 55. Wally Froiseth. Gault-Williams. Interview with Wally Froiseth, April 3, 1996. Wally has a picture of cigar boards, Dickie Cross, Gene Froiseth, board made by Tommy Kukona. Froiseth, Wally. Notations/corrections to draft, May 25, 1996, p. 3. Gault-Williams. Interview with Wally Froiseth, April 3, 1996. 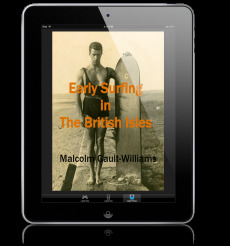 See Gault-Williams, LEGENDARY SURFERS Volume 3: The 1930s, ©2012, chapter on Tarzan. Mo-kapu (Moo-kah-poo), Kai-lua, Oahu -- originally named Moku-kapu (sacred district) because Ka-Mehameha I met his chiefs here; it was “the sacred land of Ka-mehameha” (Sterling and Summers, 5:165). Lit., taboo district. Young, 1983, 1987, p. 55. Ocean Life Magazine, Volume 11, Number 1, Fall 1995, P.O. Box 405, Davenport, CA 95017, p.8. The TransPac was in its 38th year in 1995. Patterson, Otto B. Surf-Riding, Its Thrills and Techniques, C.E. Tuttle Company, Rutland, Vermont, ©1960, p. 108. Gault-Williams. Interview with Ben Finney, April 1, 1996. Gault-Williams. Interview with Wally Froiseth, April 3, 1996. Wally has a classic photo of Duke striking his patented pose.